Launching my podcast was one of the best decisions I’ve made in my creative business. But there was quite a learning curve to get it off the ground (and some personal help too)! I’m hoping this post will help simplify things for you. Special thanks: my podcast would never have happened had I not invested in Lucy Lucraft’s amazing podcasting course – so go check out her stuff (she also offers 1-1 creative mentoring). Note before we dive in: this post is going to cover the practical stuff. If you’d like to hear more about the mindset stuff that went into launching my podcast, click here to listen to the episode where I share my personal experiences. You may have heard me mention on my show that I set up my podcast with the support and guidance of Lucy Lucraft (who runs a successful podcast of her own, What She Said). I wanted to add this in, firstly, because it would not have happened without her, and secondly, to remind you that sometimes it’s worth paying for help. I took her podcasting course with extra mentoring, and she also forced me to set a launch date for the whole thing. Lucy told me she’s planning to run the course again in future, but she also offers creative mentoring for those who think they could benefit from the extra support. I’m guessing that if you’ve landed on this post you already have an idea for a podcast you want to start. Now it’s time to flesh it out. Before I make some suggestions here I want to add that it’s my experience that the podcast will take its own direction once you actually get started. So although you might make plans now, know that it’s fine if they change as you get creating. What do you want to call your podcast? What’s the aim of your podcast? Who is your target audience and what do you want them to get out of it? Will you do interviews, solo episodes, both, or something unique? How long (roughly) do you want your episodes to be? When and how often will you release episodes? I also thought it was right to mention here that starting a podcast is a commitment, and it takes time to grow. I have personally promised myself I’ll stick at podcasting for a year and see where it takes me. You might want to consider making a similar commitment. Now it’s time to think about the stuff that often scares people when it comes to starting a podcast: equipment and tech! This doesn’t have to be scary, honestly. It’s fine to start simple and improve things as you go. And the simplest way to start is with what you’ve already got. For many people that means their phone/ laptop and some earphones with a built-in microphone. Don’t get overwhelmed. I think it’s important to do basic things to achieve a good enough sound (like the wardrobe tip, using a microphone etc), but don’t worry about it being perfect. Most of our audiences won’t care about it being perfect. I am also a big fan of not overthinking every option and just making a decision about equipment and software and just running with it. Practice. If you’re planning on interviewing guests, find a willing volunteer to practice the entire setup with. I practiced with my husband (him downstairs on Skype, me upstairs in the wardrobe!) and also with a friend who was starting a podcast at a similar time (Lisa who hosts On Our Own Terms). It helped so much and we ironed out lots of tech issues before we were under any pressure of recording a real interview. Just like your blog or website, your podcast needs a “home” on the internet, which comes in the form of a podcast host. It works like this: you upload each episode to your podcast host, and all the podcast players, like Apple, Stitcher etc., pull it in from there (once you’ve initially submitted your podcast to them – see below). The host is where you add the title, audio file etc. Again, there’s a learning curve to using these hosts, but it becomes second-nature very quickly. There are so many options for this, but here’s where I think it pays to make a quick decision and just get it done. I use Libsyn which starts at just $5 per month (I’m on the $15 a month plan based on how much I upload). If you have a website then I also think it’s worth setting up a podcast page there. Click here to see mine. If you look at any individual episode you’ll also see that I create show notes each time. If you want to keep things simple you don’t have to do this, but I find it gives my site an SEO boost, those posts get shared on Pinterest, and it’s also great to be able to send that link out to any guests that appear on my show. Lastly, it’s worth considering whether you want to create separate social media accounts for your podcast. I secured the Facebook and Instagram handles just in case I want to use them in future. Right now, though, I like to keep things as simple as possible and run everything through the one account. If solo episodes are going to feature on your podcast then get brainstorming and recording as soon as you have your equipment ready. It’s also worth doing a couple of test recordings – one where you read something you’ve previously written, and one where you improvise from a basic outline. You’ll figure out what works best for you. Personally, I prefer the way I sound when I work from a brief outline only. As for what to talk about, I have a note in my phone where I write down any ideas as I think of them. It’s also worth noticing regular questions you get from your existing audience, or brainstorming topic ideas that tie into any promotions you have planned (if you run your own business). If you’re planning to interview people, then start by writing a list of dream guests. Here’s where it gets scary – the fear of rejection is real! Here’s my experience, if it helps: I started by writing a list of 10 people, all of which I had a prior relationship with. This didn’t mean they knew who I was, but it meant I had at least been following them for a while, I knew what they were all about and I could send them a personal email letting them know why I wanted them on my podcast. I was really scared to ask them, but all 10 said yes! And if they didn’t, it was no big deal. I think it’s important to carefully consider who you invite on your podcast. Think about what your audience gets out of it, think about the unique perspective each guest brings to the table, think about diversity, think about making your podcast unique and not just having the same guests and asking the same questions. I use Calendly to schedule my guests in and I find this works well to save us both time by avoiding back and forth emails. As the date approaches, I like to do some research into the guests. I dig around the blog, social media or any podcasts they’ve previously been featured on and I come up with a set of questions. I don’t send them this list, as I like to see where the conversation takes us, but I do send them a brief list of topics a few days before the interview. If you’re nervous about interviewing people, like I was, then start with someone you feel really comfortable with. Someone you’ve been following for a while and so have lots to talk about. And don’t worry too much about awkward silences – these are easy to edit out! And know that interviewing people and asking good questions is a skill. You’ll quickly improve once you start. Click here to listen to my solo podcast episode where I spoke a little more about how much I have developed in this area. Now comes the really scary, but also really exciting, bit – launching your podcast into the world! I have a few tips from my own experience both for the run-up to the launch and the launch itself. Try to set a launch date as soon as you know your podcast is going to happen. I started preparing my podcast in August and had a launch date of October 10th in mind (with some encouragement from Lucy!). I started mentioning it on social media, I eventually added it to my bio, and I had a week-by-week plan of what I wanted to achieve in the run up to launch day. You might also want to consider recording a trailer (here’s mine) and submitting this to Apple Podcasts ahead of time to build up some buzz. Trailer or not, you’ll want to submit to Apple in advance of launch day as they can take a little while to approve it. Many other podcast directories also pull in from Apple, but you can go ahead and submit your show manually too. I made sure mine was submitted to Apple, Spotify, Stitcher, and Acast at a minimum. Keep talking about the podcast before the launch. Let your excitement about it bubble over. If you have a guest interview scheduled, make sure you tell them when it’s going live so that they will (hopefully) share it too. If possible, launch with more than one episode. This has two benefits: it’ll give more content for your new listeners to get stuck into and hopefully encourage them to subscribe, and it helps boost your show in the charts as you’ll get more downloads on day one. Write down your workflow for steps involved with editing and uploading the podcast. You can refer back to this each time you work on it, or hand it over to a virtual assistant. 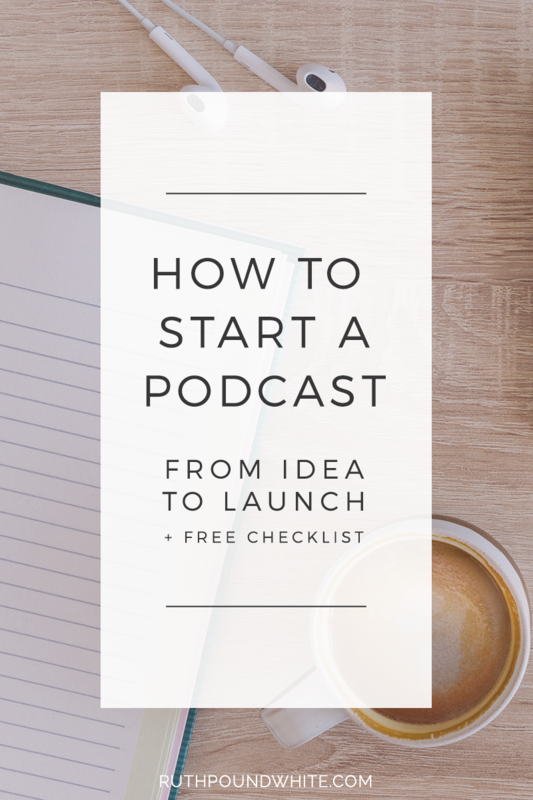 And these are the basics of taking a podcast from idea to launch. It does take work, especially at first, but in my experience it is so, SO worth it. Creating a podcast and releasing it into the world has been more creatively fulfilling than I ever hoped for. And if you could use some 1-on-1 help with putting yourself and your business out there, click here to take a look at my mentoring options. Love this Ruth! So much info and so great to read all about starting a podcast from scratch again as you really do forget how much work goes into it even before the first episode is live. And so glad we got to help each other record our test interviews together. The fear of rejection is a real thing but the thing I always reminded myself was the more rejections I received for interviews (I did get a few for my first season but not in a horrible ‘go away’ kind of way) the closer I was to getting a yes. I alway thought ‘go big’ and see who accepts 🙂 And it worked. Yes you are so right, rejections are not a bad thing, especially when you go big and see what happens! Thank you! I absolutely love listening to podcasts and have firmly told myself I don’t have time to launch my own. But knowing the steps (and your recommendations for not overthinking things) is really helpful; previously, I had little idea of what’s involved. So glad you found this useful Pauline! !